Young Kim, a 56-year-old Republican, became the first Korean-American woman elected to the U.S. House of Representatives on Wednesday (local time), by receiving 76,956 votes or 51.3 percent of the vote. Kim beat Democrat Gil Cisneros who garnered 73,077 votes or 48.7 percent in a tight race for the seat in the California’s 39th congressional district. She will take the seat being vacated by U.S. Rep. Ed Royce (Republican), who recently retired, after working for him for nearly two decades. “All the people that I met in public service, no one has ever worked as hard as Young Kim,” he said after the election results came out. 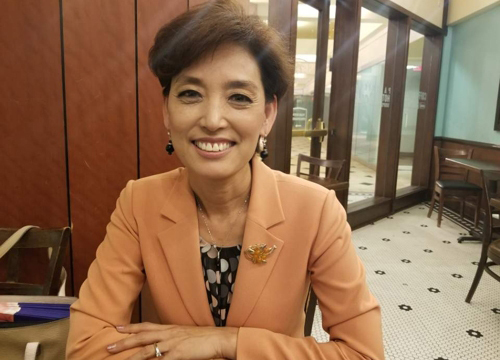 She is also the first Korean-American to be elected to the U.S. Congress in 20 years after former Rep. Jay Kim who represented California’s 41st district in 1998. Another Korean-American Andy Kim, a 36-year-old Democrat, took the lead over Rep. Tom MacArthur in New Jersey’s 3rd district. The former national security aide in the Obama Administration narrowly led the tight race by earning 148,580 votes or 49.8 percent, with 99 percent of precincts reporting. Kim is almost certain to unseat the two-term Republican incumbent although it would take several days to finalize the count for provisional and mail ballots. The final report of the race has not been made by any major news outlets in the U.S. because it remains so tight.